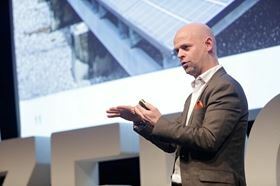 Fredrik Östbye, the new head of digital transformation at Grundfos. Östbye, a 44-year-old Swede, comes to Grundfos from the Telenor Group where he has been VP, Internet of Things. Before Telenor, he was CEO of WaterVision AB. Östbye holds a Master of Science in Electrical Engineering from Chalmers University, Sweden. “I’m extremely happy that a renowned digital entrepreneur and expert like Fredrik joins Grundfos. Not only is he a deep expert in his field, but he’s also passionate about making a difference on the global water and energy sustainability agenda. I’m convinced that Fredrik will help accelerate and orchestrate our digitalization journey for the greater good of Grundfos,” said Mads Nipper, CEO and group president of Grundfos. Grundfos says that Östbye will work closely with group management and the business’s digital taskforce to further build digitalization as a lever for reaching the company’s strategic goals. This includes digital capability building across functions, identifying and establishing relevant partnerships with other companies, as well as driving and supporting selected digital projects. He will report directly to Nipper. “Digitalization is changing the game for most industries right now, enabling new opportunities previously not possible, but also disrupting the normal. As digital expert with passion for sustainability I’m excited to take on the role to orchestrate the digital transformation of Grundfos, with a clear mission to capture these opportunities,” said Östbye. Östbye will join Grundfos on 1 May 2017, and will be based at Grundfos headquarters in Bjerringbro, Denmark.